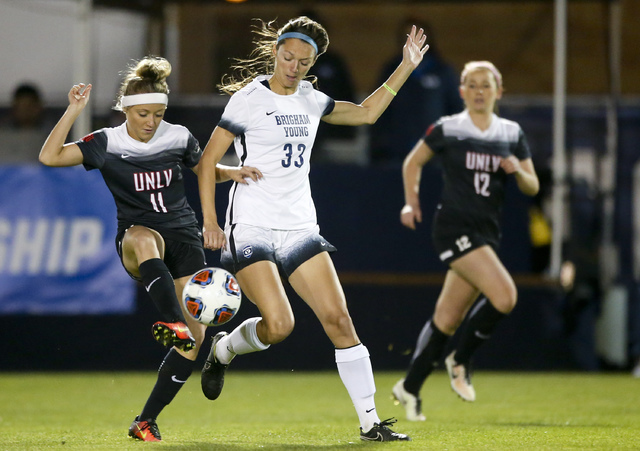 UNLV senior midfielder Sophie Cortes was named to the United Soccer Coaches Scholar All-America second team, the organization announced Thursday. Cortes, from Newhall, California, is majoring in hospitality management and carries a 3.4 grade-point average. She is the lone honoree from the Mountain West. A two-time all-league selection, Cortes had 12 goals and eight assists in 2017 for the Rebels (13-7, 5-6). Cortes’ 32 points this year rank second in UNLV single-season history, while her goals and assists both tied for third. For her career, Cortes’ 16 goals are tied for seventh in Rebels history, her 49 points rank eighth, and her 17 assists rank fifth. Cortes wrapped up her UNLV career in October as part of the winningest senior class in program history, with UNLV posting 49 wins over her four years, along with Mountain West regular-season and tournament titles and the program’s first NCAA Tournament appearance in 10 years.